Evangelization isn’t just for preachers, popes, and missionaries. It’s something all of us as baptized Christians can do. Through personal stories and examples, authors Dave Nodar, Dianne Davis, and Fr. Erik Arnold show that every one of us has the unique opportunity and ability to be a part of God’s work. Share Christ offers practical steps and encouragement, equipping you to share the Good News with love, joy, and authenticity anytime, anywhere. The book includes activities at the conclusion of each chapter designed to help the reader practically get started with evangelizing others. In addition, a study guide is included for individual reflection or group use. Dave Nodar, Dianne Davis, and Fr. Erik Arnold are leaders in ChristLife, a growing movement of missionary disciples united by a commitment to bear witness to the gospel of God’s love and empowering presence in Jesus Christ our Lord. 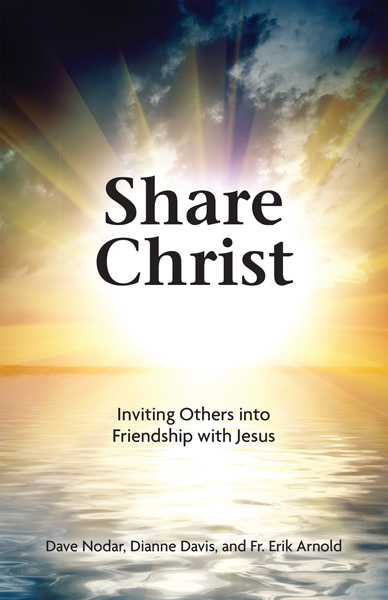 The Share Christ book is based on the Sharing Christ video series. Take advantage of bulk pricing discounts on Share Christ when buying for your parish or small group.